Examples show how to create web pages to display all articles related to a fictitious category. 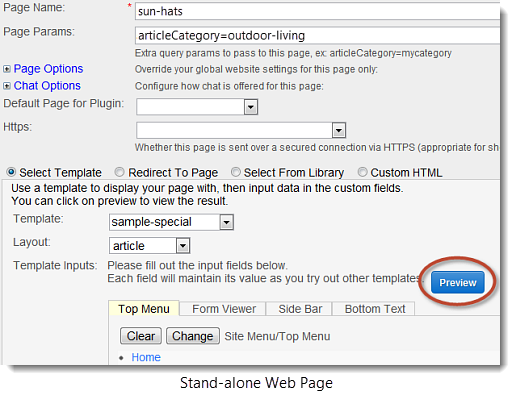 Examples show how to create both a stand-alone and redirected web page to display all articles related to a fictitious category named "outdoor-living." A category-hosting web page can be a stand-alone hosting page. Alternately, if you have an existing web page, such as an article template page, that you want to feed a category to, you may re-direct your new category page to that existing page. Add a new Web Page. Enter a name in the Page Name field. (Enter your category name after the equals sign). Select a Template / Layout and configure the Template Inputs as desired. View your web page on your website, using the Page Name you entered above. Select the Redirect to Page radio button. Choose the page you wish to redirect to (in this example, redirect to the web page named “article”). 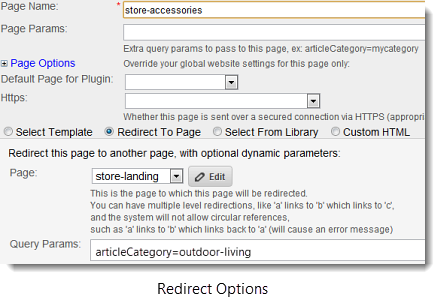 In Query Params, enter articleCategory=outdoor-living. Query Parameters are passed to the redirect web page. If the redirect web page has conflicting Page Parameters they will overwrite the Query Parameters. For more information: Parameters Reference. Remember to create a menu item or hyperlink so your users can navigate to your web page. For more information: Menus, Hyperlinks.